Slippery Elm (Ulmus rubra) is a common native tree in North Carolina, with most populations found in the Piedmont and Mountain regions. Surprisingly, Slippery Elms do not appear on the plant lists from many of our major state parks. This includes the Jordan Lake and Kerr Lake State Recreation Areas, which have thousands of forested acres in the very heart of Slippery Elm territory. There are several possible explanations for this disparity. Along with American Elm (Ulmus americana), Slippery Elm populations were devastated by Dutch Elm Disease starting in the 1930s and continuing even today. As a result, Slippery Elm has a patchy distribution, often occurring as solitary individuals and almost never in single species stands. Thus the isolated nature of their occurrence makes them easier to overlook. Another important factor is the difficulty distinguishing Slippery Elm from American Elm. They are physically very similar and both live in similar bottomland habitats. Therefore it is very possible that Slippery Elms are mistaken for, and recorded as, the more familiar American Elm. It follows then that the most important factor in identifying Slippery Elm is to understand the field signs that distinguish it from American Elm. Differences in the leaves are a major factor in telling the two species apart. The leaves of both species are large, have strongly serrated margins, are double-toothed, and have asymmetrical bases. 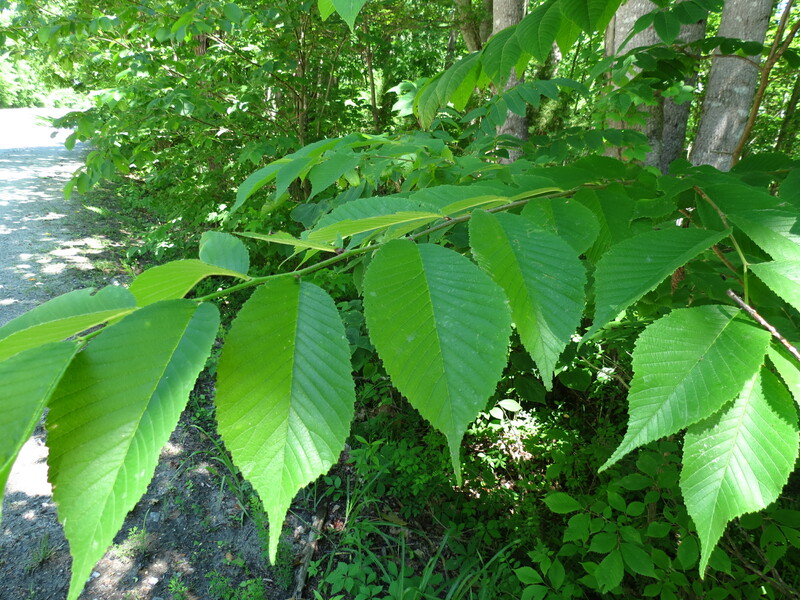 But the leaf tips of Slippery Elm have an extended tip that arises suddenly and abruptly from the leaf margins, as seen in the two photos below. While American Elm has an extended tip, it arises smoothly and evenly from the leaf margins. The photos above and below also illustrate another important field sign. The leaf blades of Slippery Elm often rise upward from the central leaf vein, giving the leaf a partially folded appearance. The leaves of American Elm appear flat. 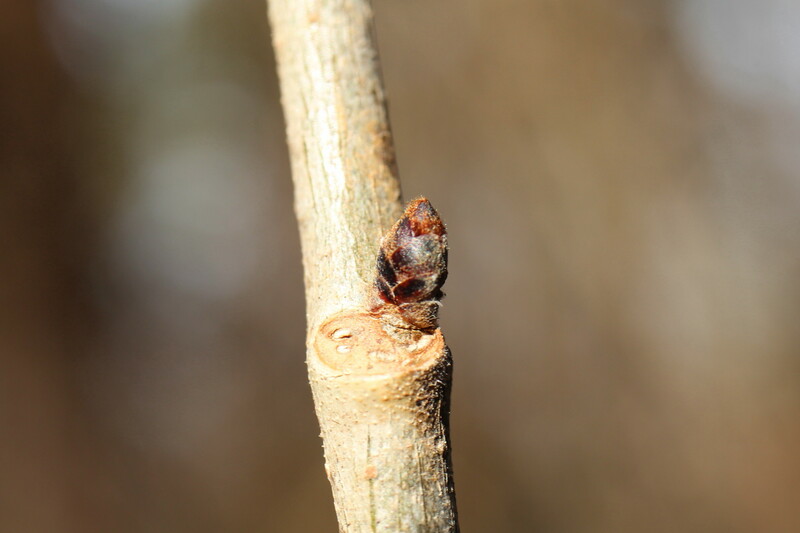 The fall and winter buds of Slippery Elm are distinctive in their reddish color, which often stands out brightly in the winter sun. The red buds are the inspiration for the scientific species name “rubra”. The two following photos were taken at the end of last November. The photo below was taken in early January. The reddish color of the buds varies. The bud seen below has scales that are very dark , almost purplish red. The buds are also frequently a rusty color, and can be hairy. Slippery Elm winter twigs (seen below) have a heavy, gray, fuzzy pubescence that is most pronounced at the terminal end of the twig. American Elm has smooth twigs. 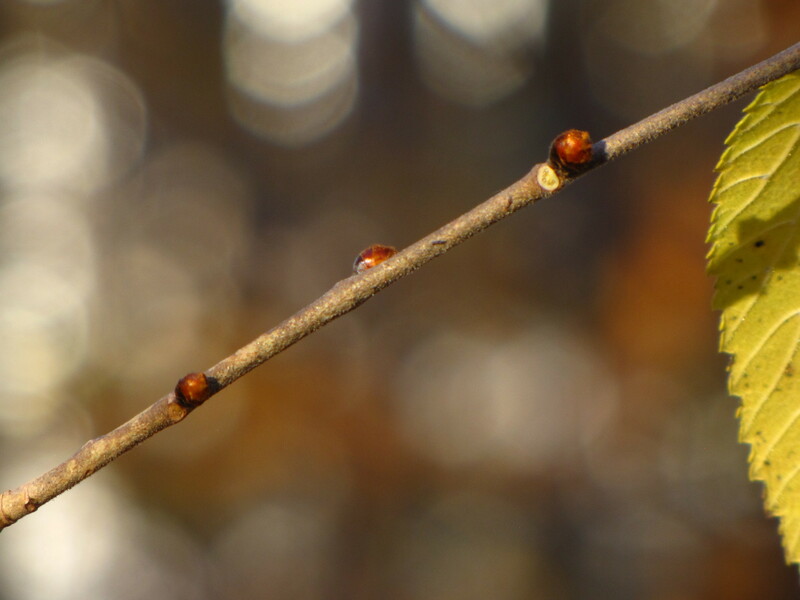 While this is a dramatic contrast between the two species, a drawback is that it requires magnification to be seen clearly, and varies in intensity from one twig to another. 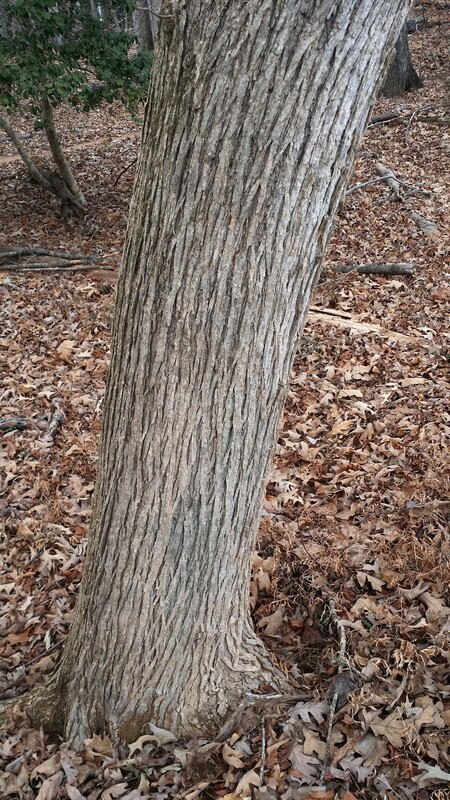 The bark of Slippery Elm is too variable to be of much help with field identification. The trunk shown below has a grayish color with long vertical ridges and some weaving. Other trunks are dark brown and have intermittent or obscure ridging and weaving. And finally, the small, round American Elm seeds (called samaras) have a distinct notch at the top, while Slippery Elm seeds have no notch at all. This can be a helpful field sign, but the seeds are limited to a brief period in the spring. The seeds are highly valued by birds, who feast on them while still on the tree, and clean them up quickly when they hit the ground. In spring and summer, watch for the folded leaf with the sudden and abrupt extended leaf tip. In fall and winter, look for the red buds. When in doubt, look for pubescent twigs and seeds with no notch at the tip. This entry was posted in Uncategorized and tagged American Elm, Dutch Elm Disease, pubescent twigs, red buds, Slippery Elm, Ulmus americana, Ulmus rubra. Bookmark the permalink. In East Texas, I always distinguished slippery elm from American elm by the texture of the leaf. 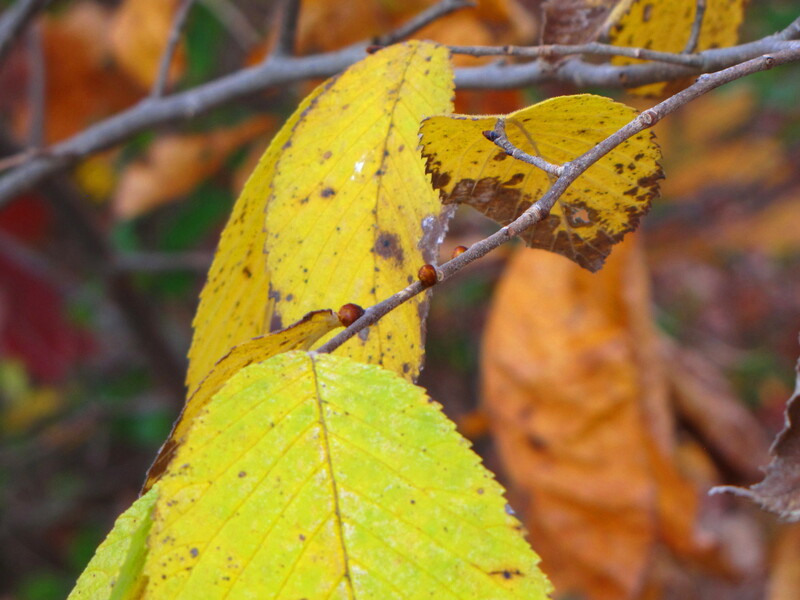 Slippery elm leaves are very rough, like sandpaper. This may not be accurate, but is the way I learned to distinguish the two species 47 years ago in Dendrology 101. You are right. 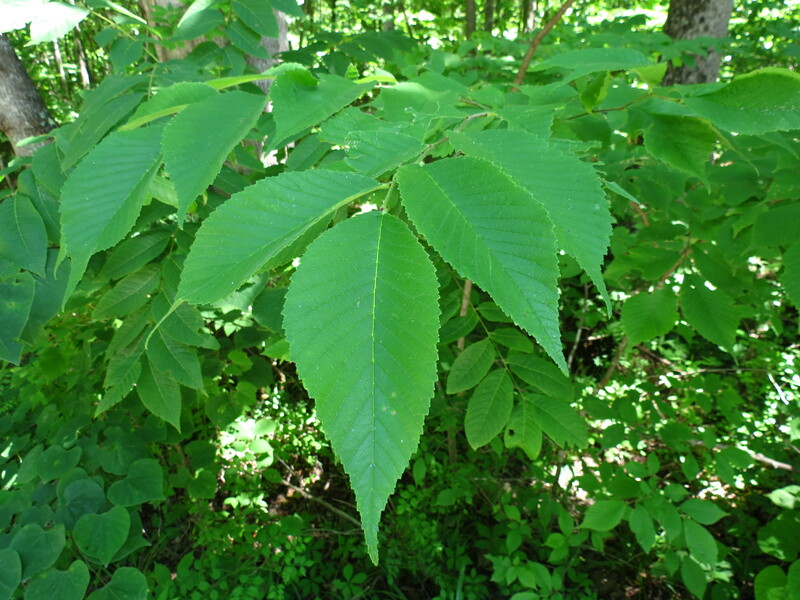 Compared to American Elm, the top surface of the Slippery Elm leaf is significantly rougher to the touch, especially in the spring and early summer, and that can be helpful in distinguishing the two. The difference lessens as the seasons advance and the leaves are beaten about by the wind. There are also occasional American Elms that display rough upper surfaces, and are more difficult to distinguish by touch.